Years ago my grandmother read us (my brother, sister and me) a story. 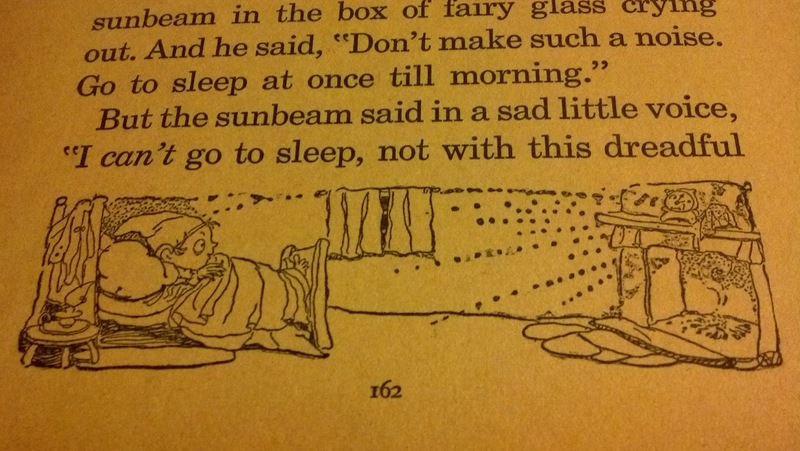 It featured a gnome who caught a sunbeam inside fairy glass. Eventually, the gnome grows remorseful as the sunbeam suffers and he lets it go. It was one of my favorite stories as a child and much to my surprise, few others knew of it. When we were adults we came across the pages in an envelope my grandma had saved before her death. We don’t know what made her save this particular story and few others, but I was determined to find the author and book, as it had been lost with the cover. It took a while, but eventually we discovered Agnes Grozier Herbertson had included the story in her collection Sing Song Stories, which is sadly out or print. I managed to track down a full copy from the Netherlands. Which leads me to sharing the text of it with you. Enjoy. 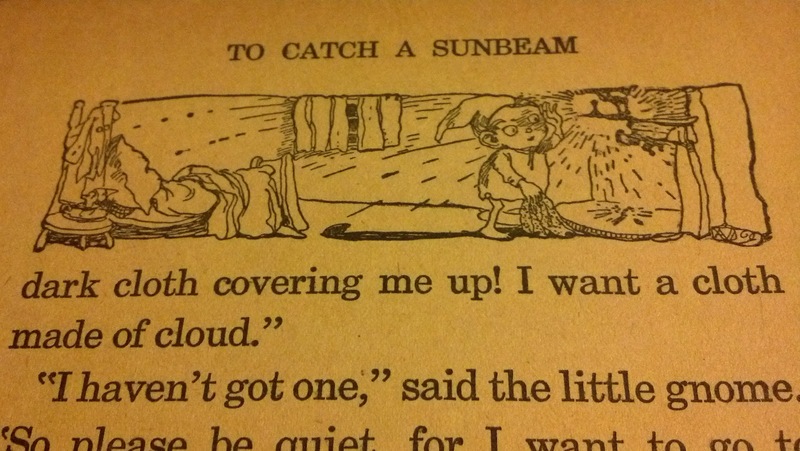 You can also hear me read The Gnome Who Managed to Catch a Sunbeam on Soundcloud. How cool!? THERE was once a little gnome who managed to catch a sunbeam. It was not a very large sunbeam, but he did not mind that. For he had been trying for days and days to catch a sunbeam, and now he had caught one. The little gnome put the box of fairy glass on his mantelshelf; and when he looked up at it, he thought it was the most beautiful sight in the whole world. But he could not look at it very long, for the sunbeam shone so brightly that it filled all his little kitchen with sunlight. “Now I am the happiest gnome in the world!” sighed the little gnome. And he skipped about as he made his porridge, and laughed and sang as he scrubbed his floor. And he made his little kitchen very clean indeed, since the sunbeam had to shine on it. But when evening came, and all the streets grew dark, the little gnome’s kitchen still shone with sunlight. And when he drew his curtains he had no need to light his candle. And the sunbeam seemed to shine more and more brightly as the night became darker. He could hardly bear to look at it. The little gnome tried to sleep in his wee warm bed in a corner of the kitchen; but he couldn’t, not a bit. So at last he got up, and placed a dark cloth over the box of fairy glass. Then it was just as if you had drawn the curtains on a very sunny day; for the little kitchen was dark, but not very dark. “Ha, that is a lot better!” said the little gnome to himself. And he went back to his wee warm bed in a corner of the kitchen. So at last the little gnome got out of bed again, and took the cloth away. And then the sunbeam shone even more brightly than before. And when the little gnome went back, to bed, he could not sleep, because of all the sunlight in his little kitchen. He could not sleep a bit. Now he could not put the sunbeam in the box of fairy glass outside, lest some one should steal it before morning. So he had to lie awake the whole night through. Then the little gnome saw that he was not going to have any peace with that sunbeam on his mantelshelf. So he took a piece of fairy twine; and he carried the sunbeam in a box of fairy glass into his garden. I cannot tell you how. 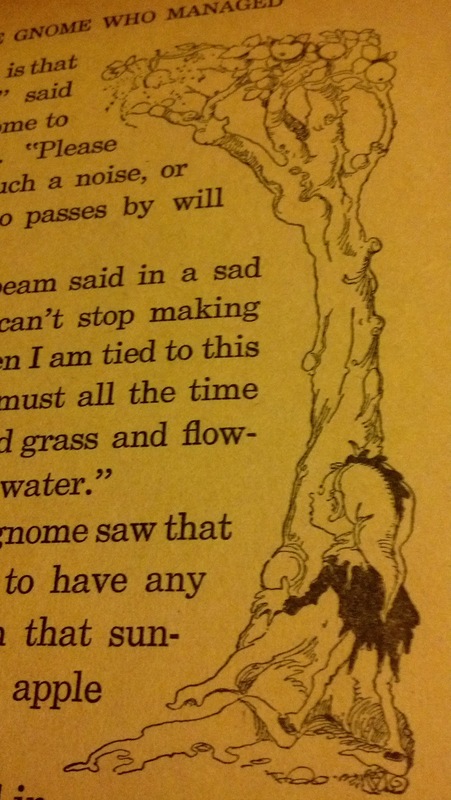 Then the little gnome saw that he was not going to have any quietness, not with that sunbeam tied to his apple tree. So he made a pond in his garden. And he stuck a long bending rod into the ground by the pond. 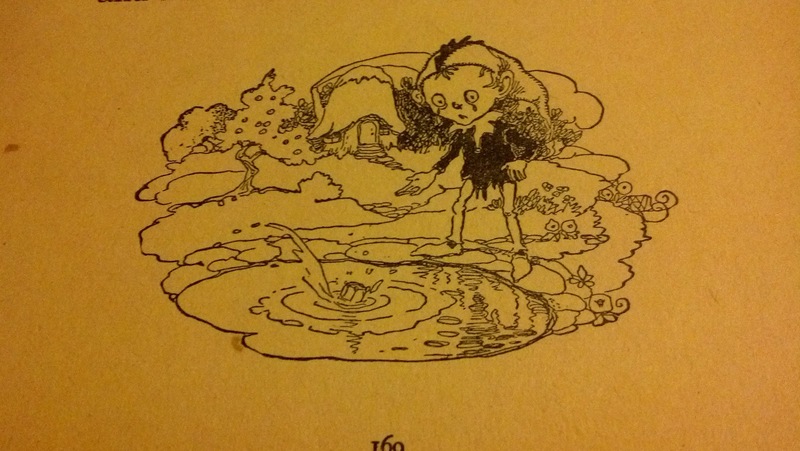 And he took a fairy pin; and he carried the sunbeam in a box of fairy glass down to the pond. And then he went indoors to tidy his kitchen, and he could see that everybody who passed by stopped for a moment to look at the sunbeam shining on the water. Then the little gnome wept two large tears. “I can see that you want to leave me,” he said. Then the little gnome took the sunbeam in the box of fairy glass from the bending rod by the pond. Then the little gnome threw the box of fairy glass into the he had made, and said, “I will never again catch a sunbeam!” And he wept several large tears. Then he went into his little house, and threw himself on his wee warm bed and slept. And a little sunbeam came and danced on his wall. So he dreamt of the land of sunbeams; and that was a dream indeed! This entry was posted in fiction, Uncategorized and tagged agnes crozier herbertson, fiction, gnomes, sing song stories, sunbeam, the gnome who managed to catch a sunbeam. Bookmark the permalink. Maria Savva has a new novel available for pre-order! I’ve collaborated many times for the Mind’s Eye Series with her and this is definitely a book you want to read. What lurks behind the door of 8 Goldfern Road? Are you brave enough to step inside? By entering the sinister house, George and Glen become entangled in a dangerous battle of wills. “The Spider” is a story of obsession, infidelity, and broken dreams. This darkly humorous mystery will appeal to fantasy and romance readers as well as those who love to hate spiders! This entry was posted in fiction, promotion and tagged fiction, maria savva, promotion, the spider, the spider by maria savva. Bookmark the permalink. I’ve spent over a week thinking of this book and how to quantify the next chapter in a saga that defined my childhood. I think it would be too easy to say it isn’t “canon” or merely “fan fiction”. Maybe because it’s hard to move on, or accept that Harry grew up like the rest of us? Or perhaps that he grew into a world that no longer finds him special or the chosen one? I had trouble accepting this, but it did not make me doubt Rowling’s authenticity. She gave us the characters after all and she ultimately decides their fates. Tolkien knew this better than anyone when he wrote his appendages and detailed the ultimate ends of his fellowship. But for me what makes this book indispensable as part of the original story is where it leaves us: in a world of magic and wonders, where essential truths persist into adulthood. I think the world and those who grew up reading Harry’s novels needed reminded that love conquers the overwhelming pain of tragedy, division within us, and even time itself. This entry was posted in book review, fiction, plays and tagged book review, fiction, harry potter, harry potter and the cursed child, play. Bookmark the permalink. Many years ago when I was growing up my grandmother read me, my brother, and my sister pages from a book with no title and no author. We never bother asking about it because we were kids and assumed, wrongly, that every child had the same book. Years passed, we lost grandma, and grandpa fell ill.
We found pages from the stories grandma read in a manila envelope. Whether she left it in the desk drawer or grandpa put it there we never got the chance to ask. Having nothing to go on but words and titles from stories, Google offered few results. It took a few years before anything was found. I discovered the stories were from an author named Agnes Grozier Hebertson and the book was titled Sing Song Stories. There wasn’t much else and it was long since out of print. It took another two years and the help of my librarian friend Sam Dailey to find a bookseller overseas with a copy. I am extremely grateful and hope these stories from my childhood help keep my grandparent’s memory alive and well. This entry was posted in fiction, journal and tagged agnes crozier herbertson, books, fiction, gnomes. Bookmark the permalink. “Human nature is not neat and predictable. What makes us betray a loved one? Can isolation lead to irrational behaviour? Why do other people’s lives always look more appealing? The book is currently available for pre-order on Kindle. Kindle release date is 18th March 2016. This entry was posted in fiction, promotion and tagged books, maria savva, promotion. Bookmark the permalink. I’m easily distracted, but I could not put Backstage down. There were times when the narration could have been subtler and the antagonist more realistic, yet I loved the story. Much like in other books by Smith, the main characters have remarkable chemistry. Whether it is the adorable lead couple Sam and Mel or the hi-jinks of young boy band, Backstage left me wanting more. I can’t wait to see what drama (and new song lyrics) the next book has in store. This entry was posted in book review, fiction and tagged book review, books, fiction, jacqueline e. smith. Bookmark the permalink. This entry was posted in book review, fiction, poetry, Uncategorized and tagged book review, books, ebooks, fiction, maria haskins, poetry. Bookmark the permalink. The third installment of Cemetery Tours did not disappoint. In fact, it appointed… hard! I felt the same excitement as when I read the first. Smith’s ghosts, action, and characters sync incredibly well together. And the dialogue never misses a beat. I feel like I’ve known Kate, Michael, and Luke for ages. I can’t think of a moment I did not thoroughly enjoy (a carnival was perfect ghostly setting by the way). Romance, intrigue, and another jaunt with America’s favorite ghost, Eugene Brinkley? I think I’ll read the series all over again. Maybe you should too! This entry was posted in book review, fiction and tagged book review, books, ebooks, jacqueline e. smith. Bookmark the permalink.